The Android operating system is one of the most widely used operating systems which have a broad user base across the world. The devices using the Android platform include phones, tablets, etc. and hence, a lot of users save their data on their devices only. It becomes a tiring task to keep the data safely always on the devices due to their robust nature. However, when the data is lost, it makes the users absolutely helpless as there's nothing they can do about that. Hence, we have brought to you the best android data recovery software which has time and again proved out to be useful in the times of distress of users when they lose their valuable data. Here are some of the best android data recovery software with pros and cons of each one of them to help the readers. PhoneRescue is one of the best android data recovery software which is available as an option to the users. This tool has an excellent service record and has helped more than 5 million customers across the globe from the issues of data loss. It is available for iOS and Windows platform too, apart from Android. The intuitive UI and the step by step wizard enable it to make the process of data recovery very simple. It has very little technical details to be taken care of by the user; hence it can be used by every person who uses the device regardless of their technical knowledge. It also allows you to choose what files you need to recover, thereby saving the space up to a great deal. Easy to use even by people with no technical knowledge. Helps to recover 31 different types of files, hence saving you in the time of crisis. Retrieves the data directly to the device. Helps to find lost data without rooting your Android device. Supports a wide range of Android devices, across all the brands. Recovering a lot of files makes it difficult to find what you need. The recovery from iCloud doesn't seem to be that promising. 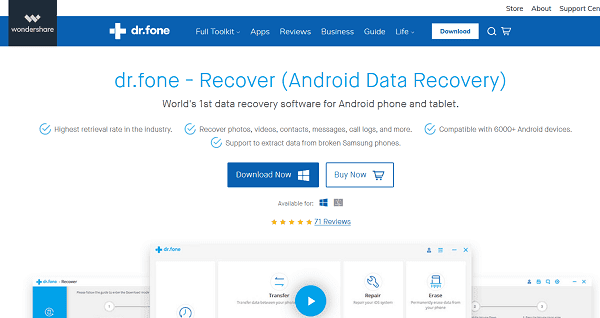 The Dr. Fone Android Data Recovery software is also a beneficial tool for securing your data on all of your android devices. It has a easy to use and user-friendly interface which is compatible with most of the android devices in service at present. Also, the easy interface allows the users of all the generations to use it for their benefits. It can provide you a secured data recovery service from your internal memory storage as well as your external storage if you want to do it. The range of files that the Dr. Fone Android Data Recovery software can recover include your text messages, WhatsApp Messenger, photos, document, call history, contact numbers, etc. Hence, you can be sure of your data security while using this software as it is also one of the best android data recovery software in use at present. It has a wide range of files which can be recovered by the system. It works on almost all the brands of Android devices. It has a nice feature to work even when the device is damaged. A feature to preview the files before actually restoring them, which enables you to keep trash away from your device. The trial version doesn't allow most of the features, so the testing cannot be done satisfactorily. The pro version comes at a substantial price, which makes it somewhat difficult to afford. The Syston Data Recovery is also one of the best android data recovery software which every user of Android should try to get his data secured from damage and losses. The most important feature which makes this software hop into the list of best android data recovery software is its ability to recover data from all the sources. It can retrieve data from your internal storage, external storage, hard drive, computer storage, etc. It's available for a variety of platforms and is extremely easy to install and use, and does not require any technical knowledge. Once the software is installed; it will scan all your files real quick at a fast pace and save your time. You are always provided with an option to use a trial version and test the software to its limits before paying the money and buying the full version. It can work on corrupted files and damaged files as well. It is safe and secure without any malware or virus. Most of the features are available only in the paid version. 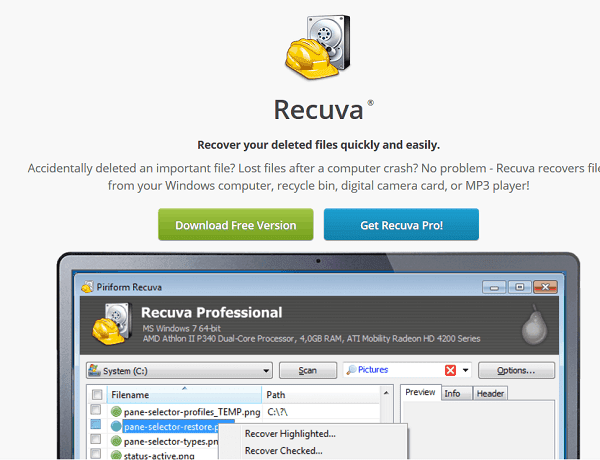 Recuva is one of the most significant applications which helps you to recover lost or deleted files. One of the most embarrassing moments when you mistakenly deleted essential files. Thus Recuva helps you to restore those files associated with either desktop or smartphones. Piriform, the creator of CCleaner Tool, develop it. It works very smoothly and fastly to recover the files deleted by mistake. It can recover various file formats deleted accidentally. Free version available with efficient tools. It includes secure delete feature. Portable version also available which runs from a USB stick. A full version is very costly for users. Trial version does not provide enough features. These were the best Android data recovery software which has been tried and tested by a lot of users worldwide. Hence, if you use any of these software, then it is quite possible that you'll become a fan of the software as well and have your data secured forever.